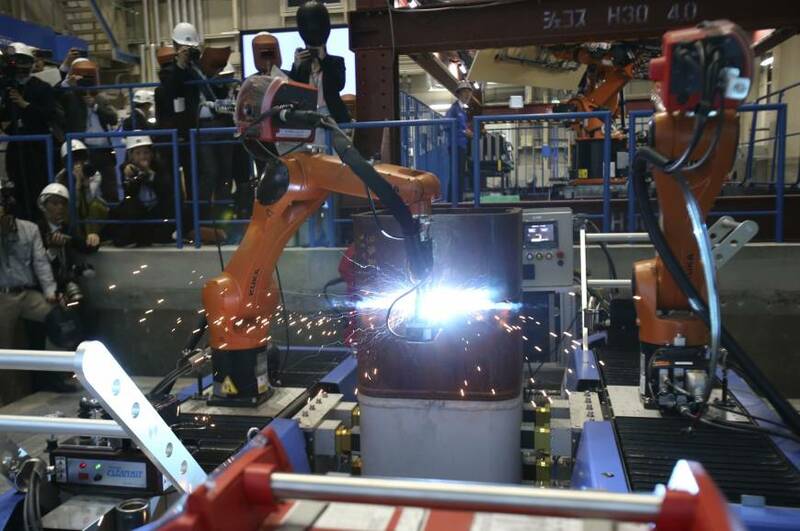 Robots that can weld, lift and bolt are being developed to help bridge labor shortages at domestic construction sites, though their use will be limited to night shifts when no human workers will be nearby due to safety and regulatory concerns. Major construction firm Shimizu Corp. showed off several robots Monday, including one already in use at construction sites that picked up a big pile of boards and took them into an elevator. Japan’s construction sector is booming, but contractors are struggling to fill labor shortages — a problem playing out in other parts of the world, including the U.S.
Robotics are common in manufacturing sites, such as auto plants, but those machines are stationery and carry out the same task over and over, often in sterile and enclosed environments. Shimizu says it is developing its own artificial intelligence systems using robots made by Kuka Robotics of Germany. Shimizu showed that in a typical task, a worker must use one arm — and his helmeted head — to hold up a board and hold bolts in his mouth while using his other arm to bolt a board in place using a hand-held machine. Using robots makes sense in urban construction, where buildings are tall rise and the same work is repeated on each floor. In Japan, where the birthrate has been declining for years, the workforce has also begun to shrink. Many construction workers are older, and contractors are having a hard time attracting young people, Indo said. Shimizu, which is involved in a number of overseas projects, said it is looking into exporting the robotics technology, but no decision has been made yet. 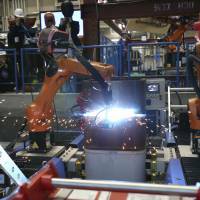 robots, Robotics, labor shortage, Shimizu Corp.